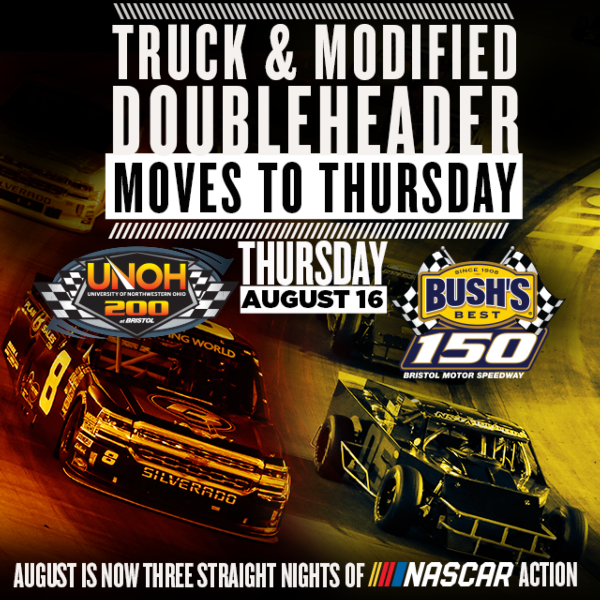 Today officials from NASCAR and Bristol Motor Speedway announce that the UNOH 200 NASCAR Camping World Truck Series race and Bush's Beans 150 NASCAR Whelen Modified Tour event will move from Wednesday, Aug. 15, to Thursday, Aug. 16 in 2018. The schedule change packages an adrenaline-filled three consecutive nights of under-the-lights racing during the Aug. 16-18 Bass Pro Shops NRA Night Race week. 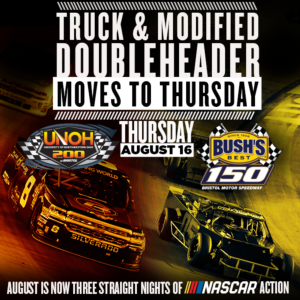 The Bush's Beans 150 will kick off Thursday's action with a 6:30 p.m. starting time and the UNOH 200 Camping World Truck Series race will be held Thursday at 8:30 p.m. and televised on FOX. Qualifying for both events will take place earlier that afternoon, with the Modified Tour at 3:15 p.m. and Truck Series at 4:35 p.m., respectively. Thursday's racing serves as the lead-in to one of the most anticipated event weekends in all of NASCAR. The Xfinity Series Food City 300 will take the green flag Friday night to set the stage for Saturday's tradition-rich Bass Pro Shops NRA Night Race, a 500-lap Monster Energy Cup Series event under the lights that has showcased some of the most intense on track battles in NASCAR history. Details regarding all supporting events surrounding the date change will be announced at a later date. "Moving the Camping World Truck Series race to Thursday allows for three consecutive nights of NASCAR action, making it easier for fans to attend each race of this can't-miss weekend," said Ben Kennedy, NASCAR Camping World Truck Series general manager. "We appreciate the effort from our partners at Bristol Motor Speedway, FOX and the race teams in putting the fans' interest first." "We are excited that the UNOH 200 will serve as the anchor event for Thursday night's racing action during Bristol Motor Speedway's upcoming August weekend," said Dr. Jeff Jarvis, president of UNOH. "We applaud NASCAR and Bristol Motor Speedway's efforts to package the weekend schedule so that fans and everyone in the industry can maximize their time at the speedway. UNOH is proud to sponsor the NASCAR Camping World Truck Series race in what we believe is the most thrilling three nights of short track racing on the NASCAR circuit." "Bush Brothers & Company is proud to work with our partners at Bristol Motor Speedway to make the best race experience in NASCAR even better," Drew Everett, chairman of the board for Bush Brothers & Company. "We think this is a great opportunity for fans to see four exciting, short-track races in three days and we are excited that the Bush's® Beans 150 will start it off on Thursday!" "We're blessed to work with so many quality partners who pulled together for the fans to make this schedule change happen," said Jerry Caldwell, executive vice president and general manager for Bristol Motor Speedway. "We have received a lot of feedback over the years suggesting this change and through a number of meetings with NASCAR, television and sponsor partners, we all agreed that this move was in the best interest of the fans. We're looking forward to showcasing the best three consecutive summer nights of racing in all of motorsports this August." To purchase tickets to the UNOH 200, Bush's Beans 150, Food City 300 and Bass Pro Shops NRA Night Race, please call 423-BRISTOL or buy them online at www.BRISTOLTIX.com.